- Rehabilitating and providing education, shelter and food to economically backward, child labourers, disabled, orphans and semi orphans. - Sensitizing destitute women and adolescent girls for their rights & entitlements. - Ladies Empowerment and promoting SHGs. - Sponsoring midday meals and groceries for old age groups, to enable them to get timely food. - Enlightening and educating the indigenous people and remote rural masses. - Spreading awareness about HIV/ AIDS, TB, Malaria and conduct medical health camps for the remote rural tribes. - Organizing seminars, impact studies, workshops, research study and awareness campaign on educational policies, statistics, health, legal issues, women and children developmental activities. - Encouraging sustainable agricultural development and organic farming. - Establishing unity, integrity and communal harmony. - Encouraging adult education among rural masses and slum dwellers. - Working for persons with disability. Kurnool based grass root level NGO is involved in Charity work for Scheduled castes, Scheduled tribes, other backwards classes and Dalits. A Team of youth, who have passion in social service and compassion towards the sufferings of the disadvantaged sections of the society, came together and formed SERUDS. They have clear insight in the socio-economic and health issues faced by the downtrodden, under privileged and marginalized segments of the communities. SERUDS NGO India is a non-governmental, non-profit, social service voluntary organization working for an integrated development of women and children of vulnerable segment of the society. SERUDS believes that all human beings are equal and has the right to have good health and proper standard of living. SERUDS has touched new heights by Regular Activities to fulfil the mission of organization. Our executive committee oversees all the organization’s efforts. The committee meets regularly to ensure that all of our teams perform efficiently and to facilitate cross-functional connections. Our team of excellent staff, volunteers & members, who are dedicated, are available for any social cause (s) always. They are our real strength to carry on with the noble cause of uplifting the downtrodden and send a message “WE CARE & SUPPORT”. 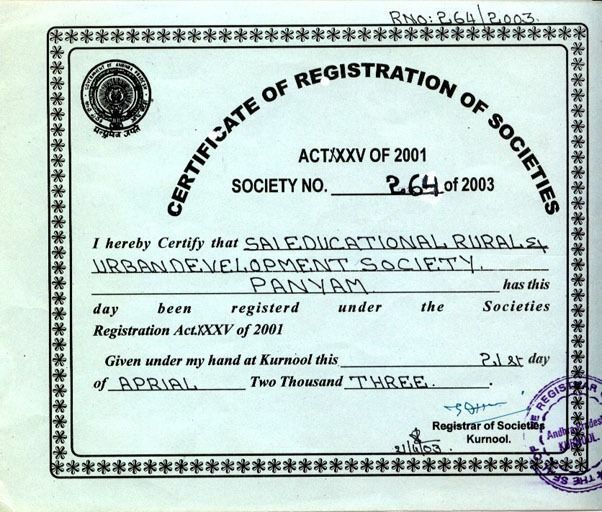 SERUDS was registered in the year 2003 under A.P. 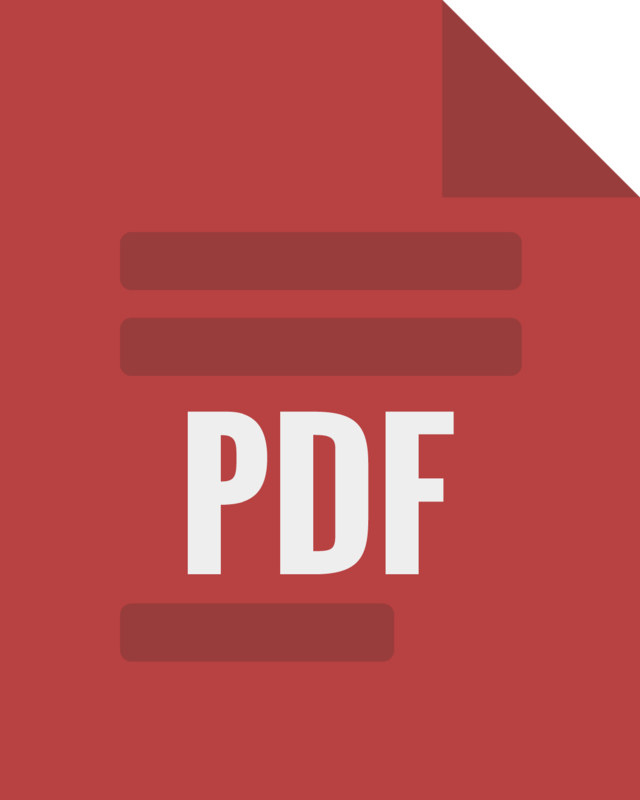 Societies Registration Act, 35 of 2001. 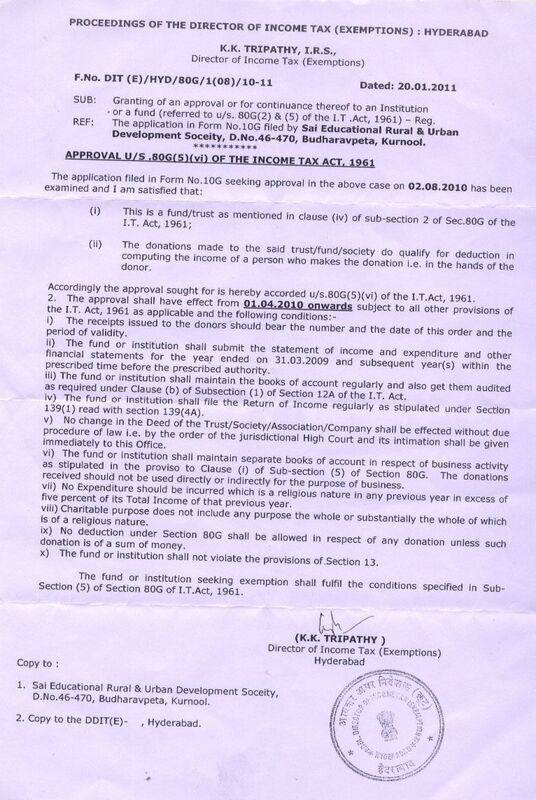 It is also registered under the FCRA, 12A & 80G of Income Tax Exemption Act, 1961. SERUDS is completed due diligence norms and listed with CREDIBILITY ALLIANCE, VANIINDIA & GUIDE STARINDIA. SERUDS has been collaborating with foreign donor agencies, corporate, national donor agencies both governmental and non-governmental towards making meaningful interventions for the cause of poor and needy sections of the society. - SERUDS is registered under the Andhra Pradesh Public Societies Registration Act, XXXV of 2001 (Reg.No.264 of 2003 dated 21st April 2003). 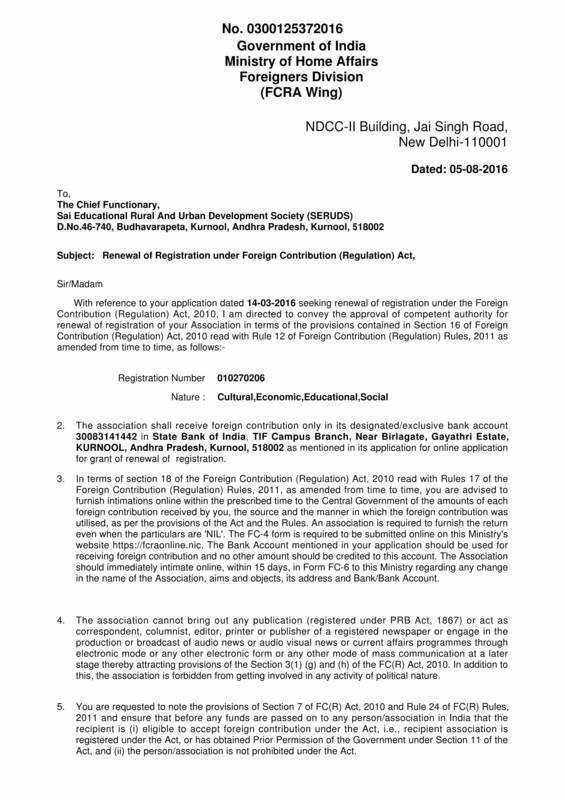 - SERUDS is registered under section 6(1) (a) of the Foreign Contribution (Regulation) Act, 1976 (FCRA Reg.No. 010270206). 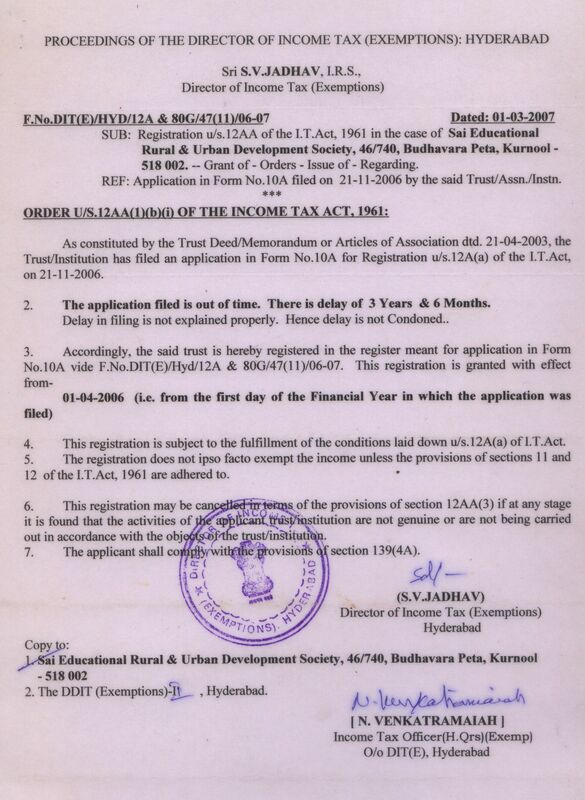 Mr.K.Raghuveer Singh, Chartered Accountant, 41-473-N, Opp:Dist.Court, Kurnool-518 004, Andhra Pradesh, India. Mr. G.Mallikarjuna, 33 , the President of SERUDS is a graduate in Bachelor of Engineering from VASAVI COLLEGE OF ENGINEERING, Hyderabad. He is passionate in social service and started working as a social worker at the young age of 24yrs. He has compassion towards the sufferings of deprived and downtrodden sections of the society. He was surprised seeing the atrocities and discrimination faced by women, children, dalits and hence decided to support them with equity, justice and empowerment. He has been struggling to mobilize resources for the cause of poor and needy. He aims to distribute resources equally to all the sections of the society. - Trainer and training module developer. - Associated with livelihoods learning programs organized by Govt. of AP. Inducted/ oriented/ mentored social work professionals. - Practitioner of participatory processes applied/fine-tuned and practiced in a variety of contexts. - Pioneered/been part of evolution of processes of significance/consequence to development sector. - Led NGO Assessment and Development Partner Selection Processes for various projects/tasks. Outreach of influence to more than 5000 families. - Contributed towards professionalizing development practice domain.